With SystemOne CM (Compact Multiaxis), LTI Motion has launched a compact automation system. It consists of the 'MotionOne CM' controller, the central feed unit and the 'ServoOne CM' multi-axis servo controllers, which can be connected in series, and thus represents a scalable Ethercat-based automation system. 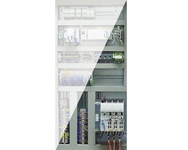 A servo controller that is only 55 mm wide conceals up to 18 A motor current plus three times the overload. In the other sizes 2 to 4 (110 mm, 165 mm, 220 mm), the company offers a performance spectrum of up to 210 A. Thanks to a separate controller for each axis, up to three motors can be operated in the multi-axis servo controller without any losses in control technology. The system thus covers motor currents from 3 to 210 A. In drive technology, there is usually one encoder cable in parallel to each motor cable. When using the single cable solution HDSL, the encoder cable can be omitted. The encoder signals are carried in two cores of the motor cable. The integrated controller with its scalable processor performance (Intel Atom with 1.3 GHz to Intel Core i3 with 2.2 GHz) is suitable for simple to highly demanding control tasks.